When the Phillies played Atlanta on the season’s final day, there were questions about whether Philadelphia manager Charlie Manuel would go all out for a victory. It was a must-win for the Braves, but not for the long-since-clinched Phillies, and he had the clear option of resting his roster in advance of the playoffs. In the end, he did a little of both. Manuel started his regulars, and left his entire starting outfield in for the game’s duration. Even though every infielder was pulled early, they each got at least three at-bats. Manuel even pulled off a double-steal in the eighth inning, and his team battled back from an 8-2 deficit (thanks largely to its bench) to pull within 8-7. Still, that Cole Hamels went only two shutout innings (followed, though not consecutively, by an inning each from fellow starters Roy Oswalt and Joe Blanton) could be openly criticized. Manuel, however, did what he felt was best for his team. He also brought to the fore an unwritten rule that’s valid only in the season’s final days (or sometimes weeks): teams with nothing left to play for should give their best efforts down the stretch against teams that still have hope. It’s why in 1991, the fourth-place Giants trotted out a series of young players when facing the sixth-place Astros in their second-to-last series of the season, but utilized their starters against the Dodgers in their final three games. Los Angeles was battling the Braves for the N.L. West crown, and after the Giants won two of three, had to settle for second, one game back. In 2004, Rockies manager Clint Hurdle paid no attention to the Code, trotting out lineups with as many as six rookies for Colorado’s season-ending series against Houston. San Francisco would have taken the wild card had the Rockies won a single game in that series, but the Astros swept, winning it for themselves. The counter to that opinion comes from no less an authority than Tigers manager Jim Leyland, a man whose track record of putting his team before any sort of moral convention is unmatched. 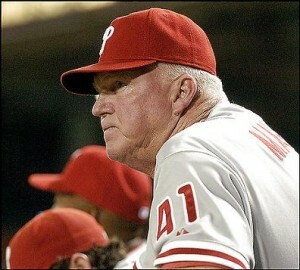 In Atlanta, Charlie Manuel had the best of both worlds. His pitchers are rested, his regulars gave it their best, and nobody, really, is complaining. Who’s to complain? The Padre’s? The Padre’s had every opportunity to win the West or the Wild Card. They controlled their own destiny and they choked. They only have themselves to blame. Besides the Phillies won the first 2 games. If the Padre’s need the Phillies to sweep the Braves to make the postseason then maybe they don’t belong there to begin with. Precisely right. The Padres (and any other team trying to play divisional catch-up) would hardly have been in such dire straights had they taken care of the Cubs a week earlier. That said, the Padres played their full schedule against teams giving it their best; it’s not a lot to ask for something similar for the Braves. Nobody has truly criticized Manuel over his handling of the final game (not that I’ve seen, anyway), because he doesn’t really deserve criticism. Some managers, though (like Hurdle in ’04) who raise considerable ire for their roster decisions.